And now for something different, but not completely different: CycleKarts. CycleKarts are not completely different because they are part of a well-known theme. CycleKarts fit somewhat neatly into the theme of low-cost racing, a theme that has been a constant refrain since at least the post-war period when racers wanted to race, but few had money. Relatively inexpensive sports cars (a new Austin-Healey Sprite sold for $1975 in 1959) became popular during that period, as did sports car clubs, which were mostly volunteer organizations set up to allow racers to race. In recent times, we’ve had karting and LeMons and ChumpCar World Series and other efforts to make road racing more attainable. CycleKarts fit loosely with this theme, but take a different approach. 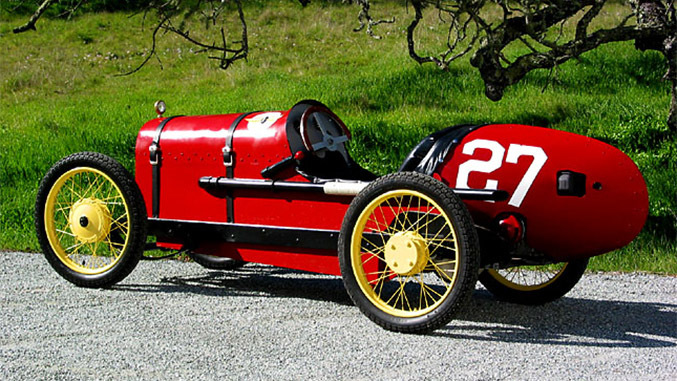 CycleKarts seem to be aimed not at the grassroots road racer, but perhaps at the would-be vintage racer who is priced out of the market. With historic race cars selling for millions and even Porsche 356 race cars going for $75k or more, racers on a budget have to do even more work than regular road racers to keep the costs down. CycleKarts address thise issue, but they way they do it may either have huge appeal to you, or may leave you cold. 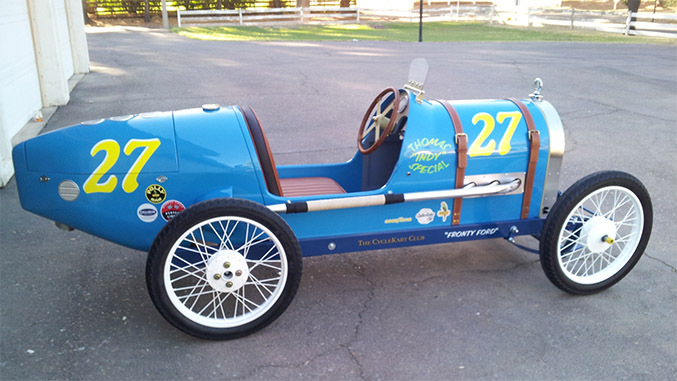 A CycleKart is a custom-built, one-of-a-kind race car modeled on pre-war open-wheel racers. CycleKarts are small, but sized for adults. The drivetrain is built around a 200cc Honda single cylinder engine making 6.5 hp (that’s six point five, not sixty five). The cars weigh a maximum of 250 lb., so that yields about 60 lb/hp, giving the cars much "worse" power:weight ratios than, say, a Spec Miata (20 lb/hp). 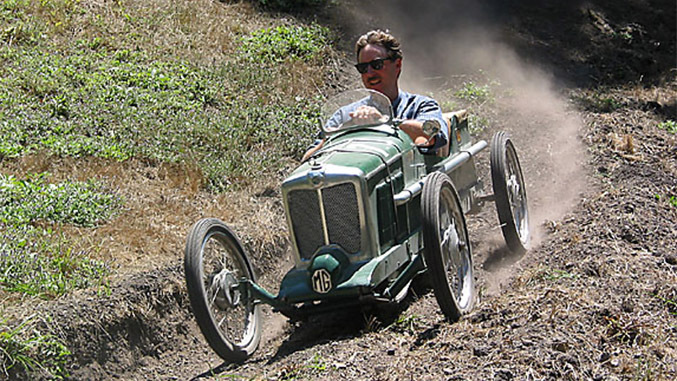 Obviously, that seems rather unexciting if your alternative vintage racers are, say, the 1936 V-16 Auto Union Type C, or a 1973 1580 hp Porsche 917/30 Can-Am car. Those super-expensive and obviously unrealistic vintage cars aside, some would reflect that power:weight doesn't have much to do with fun. Spec Miata has about the worst power:weight ratio in club racing, but is amongst the most fun classes. Elements like the feel of the car, easily approached limits, and driver positioning also matter. And if cost is an object, which it certainly is for most people, then the roughly $2500 total parts cost for a CycleKart might have some appeal. Where Do I Get A CycleKart? To turn that $2500 of parts into a functional racer, you have to do some work. In fact, you have to do a lot of work. Part of the ethos of CycleKarts is that they are designed, fabricated and built by you. 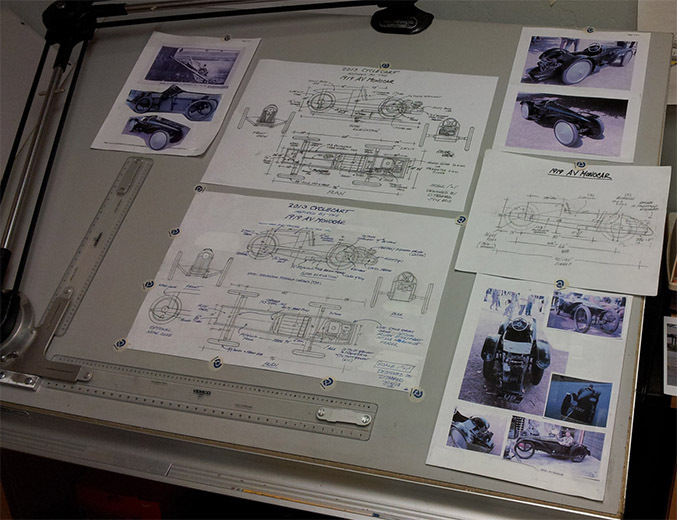 You select a pre-war car as a model, you prepare drawings, you create your chassis (probably from plywood), you fabricate various metal bits where needed, you source the (sometimes rare) parts that the “specification” calls for and you put it all together. To say it another way, there is no kit. There are no builders from whom you can buy completed cars. And this isn’t because no one has thought of it, it is part of the CycleKart philosophy (although this is America, so someone could offer these services anyway). You have to get comfortable with this philosophy. We would add that it is pretty much true that you have to “get” the philosophy of any racing class you join to enjoy it, though an advantage of CycleKarting is that the principals actually tell you what is what. It is also worth considering that the specification isn’t random. For example, in answer to the question “why not use a bigger engine?” the Stevensons point out that doing so would reduce the fun, based on trying bigger and smaller cars. But they add another bit of philosophy: “we’re going for visceral sport, not speed.” We would add that, in general, as speed goes up, so does cost. Even though speed isn't the goal, that doesn't mean that there aren't engineering differences between the cars. Mike Stevenson points out that to get the most exciting feel behind the wheel, builders must pay attention to chassis stiffness. Doing that and keeping your CycleKart light takes some ingenuity. Where And How Do I Race One? Like many things with CycleKarts, you are mostly on your own. For example if you happen to own a ranch or a farm, or know someone who does, you could set up a course on that and invite your CycleKart buddies to race. Given the DIY elements of CycleKarting, this should probably be seen as another opportunity: you get to become a course designer (show up Herman Tilke) and an event operator (let SCCA or IMSA know how it should be done). At this point in time the main organized racing is put on by the Gittreville Grand Prix. The current once-a-year venue is in Tieton, Washington during June. Tieton is a small apple farming community that is located 18 miles northwest of Yakima. This is a low key event in a nice little small town where they are willing to close off the streets for CycleKarts. There is also a local farmer who lets Moto-CycleKartistes race in his orchard to create some variety of events during the weekend.